In November of 1994, CRASH organized a talk by Steve Roberts, technomad and internet expert, at the University of Houston. 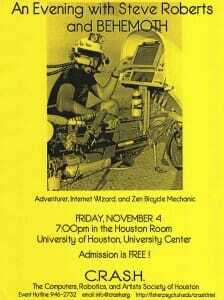 He spoke on his trip around the US on BEHEMOTH, his high tech recumbent bike. BEHEMOTH has several computers on board (including a Sun SPARCstation and a SPARCbook, a Macintosh, and two DOS compatibles), as well as satellite and radio capabilities. During the event, Steve presented BEHEMOTH on site. He began with an overview of the entire adventure, covering the electronic system in detail. He threw in anecdotes from the road, and spent lots of time answering questions from the audience. CRASH organized the event, along with the help of Justin McMurtry of the Campus Action Network at the University of Houston. Henry Trueba, Provost of the University of Houston, was also instrumental in making “An Evening with Steve Roberts” a reality. Posted in Events and Speaking Gigs and tagged C.R.A.S.H.